Considering visiting St Andrews, Scotland? (The Scotland bit has been added to avoid confusion, given that there is a St Andrews in New Brunswick, as well as an, uhmm, St Andrew, whose epithet appears on all kinds of stuff.) Here is some information to help you decide. There's a good chance, you’ll be in Edinburgh and wondering if you should take a wee tour up to St Andrews. I say ‘wee’ not just because it gives an authentic Scottish ambience to the proceedings – and it is a word I use habitually, though mostly only referring to my annual income – but because a tour to St Andrews from Edinburgh is no big deal. It’s an easy day out, basically. You can drive to St Andrews in a bit over an hour. Or you could choose a fun day with Rabbies Tours to St Andrews and the quaint fishing villages of Fife. Or you can catch a north-bound train ( to Dundee or Aberdeen) and get off at Leuchars, where connecting taxis or possibly a bus will await. It is then only 20 minutes to St Andrews. If you drive - you could go via the East Neuk of Fife. This is the nicest bit of Fife - untouched by the Industrial Revolution. There are no 'former mining communities' here. It is quintessential Lowland Scotland – all barley fields, brambles (blackberries) in the hedgerows, little peaceful red-roofed villages such as Crail, Anstruther and Pittemweem- with glittering views southwards to the sea, and across to Edinburgh and the Lothians. From a heritage point of view, St Andrews got lucky. It was formerly the ecclesiastical capital of Scotland, before the 16th century Reformation swept the old ways aside. Today, the scanty remains of what was once the largest cathedral in Scotland still dominate the skyline. As a massive multi-towered structure, it is sometimes said that its design defeated the available technologies of the day. Both fire and structural collapse feature in its long history. Building work started in 1158 and continued for more than a century. And if that seems a far distant past, then it is a sobering thought that the square tower of the even older St Rule's Church, which is the ruinous cathedral's close neighbour, not only still stands but you can still climb to the top of it, for a high view over the original mediaeval street plan of St Andrews which can still be made out at the core of the town. Nearby, St Andrews Castle, once the home of the local bishops, is a little more intact -in the sense that a visitor can imagine what it must have been like when it was the ecclesiastical seat, and has an excellent interpretation centre - a real ‘must visit’. 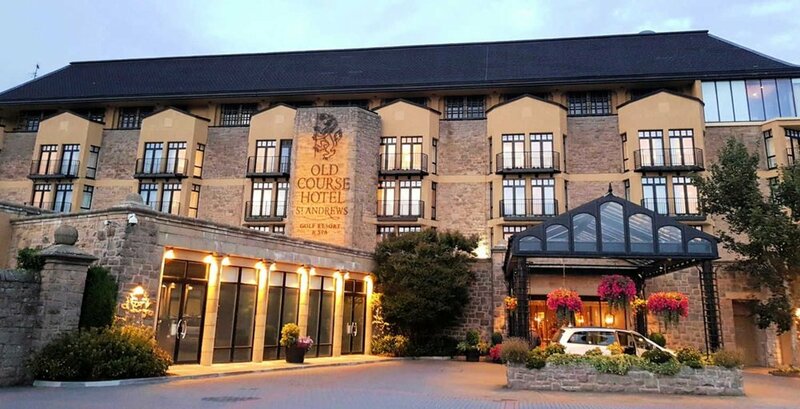 Check out Booking.com for more places to stay in St Andrews. St Andrews- for eating and drinking. Any other town would have been happy with that heritage but our St Andrews is also the home to Scotland’s oldest university (1413). From many Scots’ point of view, it had for years the reputation as the least Scottish of Scotland’s universities – a distinction bolstered a few years back by it being the setting for the wooing of Kate what’s-her-name by that royal chap, uhmm, William Windsor. Anyway, whoever they were, there was a huge amount of international media interest and Katie and Wullie got married and lived happily ever, settling down to the serious business of producing offspring so that the status quo of power and privilege enjoyed by England's royals would continue for a few more generations. And some St Andrews eating and drinking places may still have notices on them saying ‘William and Kate shared a panini here’ or whatever. As you may have gathered, it leaves me in bewilderment why anyone would be interested in this sort of thing, but I guess I am the one out of step. We also like Kinnettles Hotel (eat & stay) and The Adamson as stylish place to eat , Janetta's for great ice cream and Cromars for fish and chips, The Criterion Pub in South Street and oh! Fisher and Donaldson in Church Street for their vanilla slices, or mini rhubarb tarts or their famous fudge doughnuts! (I once nominated eating their delicious vanilla slice as one of the ten things in Scotland you had to try before you die!) Oh, and the Fife Food Festival takes place in May. (One of the most-used tag-lines in Scottish tourism, I just deleted a long aaargh from the header here.) OK, we have ecclesiastical significance and ancient university, which certainly has an impact on the town. But wait, there’s more. 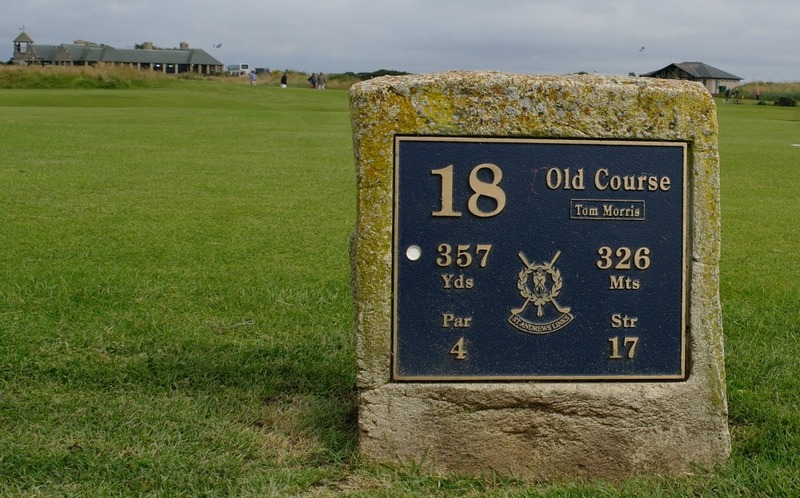 Sea-washed, rabbit-nibbled short turf for the greens; rabbit holes for, well, the holes; round pebbles for balls and driftwood for clubs…..and a credible story that the whole thing started in Holland….all of this evolved into ‘the Home of Golf’. 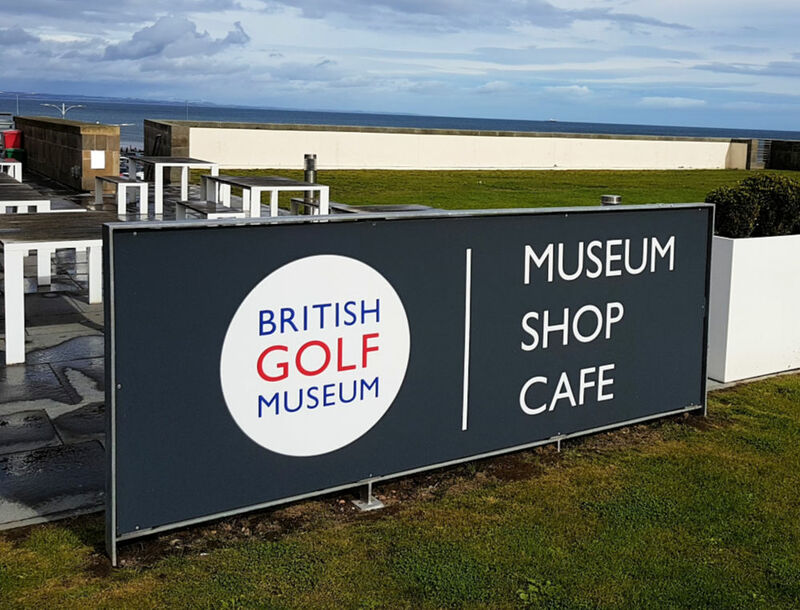 The British Golf Museum Cafe is a great place to enjoy a snack and superb views of the golf course and West Beach. Pictured here. St Andrews, Old Course 18th Hole. Gosh, this is a dull caption. Frankly, it’s all too much. How much luck can a Scottish town have? Religion, academia and a hugely popular game played across the world. Yes, in combination, these are the reasons why you should visit St Andrews. That and the shops – catering for the well-to-do golf widows, for a start. And the choice of reasonable places to eat and drink. Finally, then there is the sheer ambience of east coast Lowland Scotland. It feels a long way from the Highland hills – though you can see the hills of Angus from the ramparts of St Andrews Castle. In short, why would you not want to go? There are historic buildings, shops, heritage, endless golf courses - and those long sandy beaches where in your mind’s eye you can easily see that slow-motion athlete in the baggy shorts with the Vangelis theme ‘dum-dum-diddle-dum-dum....’ playing in your head – oh yes, that Chariots of Fire movie was filmed here. 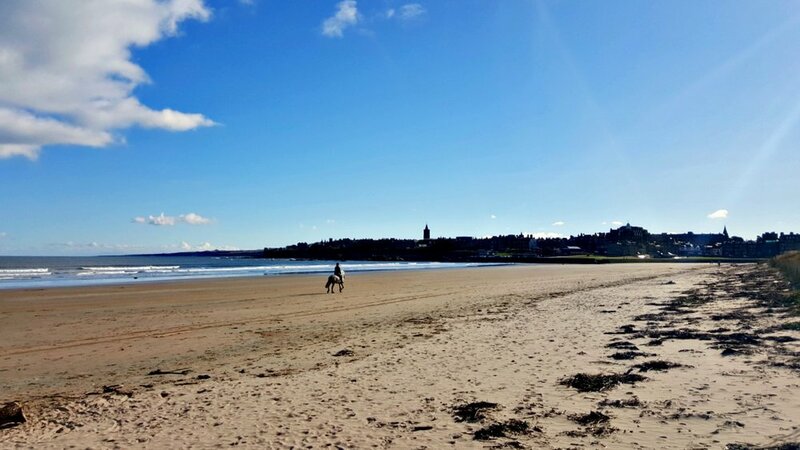 St Andrews West Sands Beach - where you can have your "Chariots of Fife" moment. But wait, there’s even more. There is some great accommodation around St Andrews. So, you don’t even have to stay in Edinburgh. That way there is more time to explore the East Neuk of Fife. ‘Neuk’ in the context, means 'corner' in Scots, though, etymologically speaking, it seems to cause no end of sniggering from Belgians in particular, who seem to think it means something else. Anyway, the eastern corner of Fife has some really photogenic fishing villages. They have red pantiled roofs, whitewashed harled walls and crow-stepped gables in particular. A crow-stepped gable is a sure sign that the architecture has been influenced by the Low Countries and this in turn is a reminder of formerly independent Scotland’s old trading links across the North Sea. And harling is what we call pebble-dashing. Crail harbour - in the East Neuk of Fife. Crail is the most photogenic village of all, a classic old Scots burgh, complete with tollbooth, mercat cross and picturesque harbour. Anstruther has a busy waterfront (with a fine seafront fish and chip shop). The Scottish Fisheries Museum is also here – well worth a visit as an antidote to the tartan-clad Highland view of Scotland, as it portrays the struggle of the east coast Lowland folk to earn a living from the North Sea. 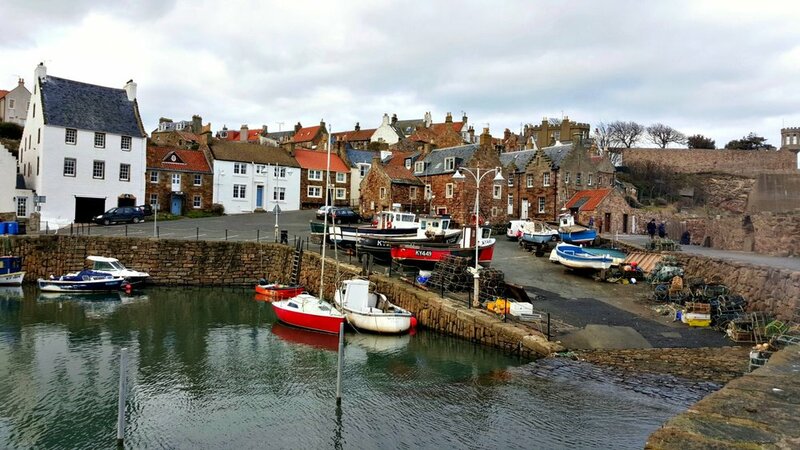 Another community, Pittenweem, has an especially attractive harbour-front – just the place to get those arty shots of lobster creels or colourful floats attached to fishing nets. Overall, the East Neuk villages are well worth an excursion - and they all lie close together. And, they also face south – not a common aspect on the coast of Scotland. Is St Andrews and the East Neuk a Must See? So, does St Andrews qualify as a must see? Hmm, yes, overall. And it also has some pretty impressive low rainfall and high sunshine records (for Scotland). Either include it as a day-trip from Edinburgh, or spend a day or two there as part of a longer Scottish tour. THE St Andrews must see for me is a moment of Scotland’s history that is brought vividly to life in the mine and counter-mine at St Andrews Castle. And it is completely unique in Scotland. And it's also one of the most graphic reminders of the religious conflict in the story of the nation of Scotland. Let’s picture the scene. It’s 1546, the Reformation is under way and Scotland is ablaze with religious fervour. Protestant reformers, supporters of the preacher David Wishart, have seized the castle at St Andrews and murdered the resident Catholic Cardinal Beaton (who had previously got rid of Wishart by burning him at the stake – slowly). Then, having taken the castle, the forces of the Reformers try to hold on behind the walls. The Catholic forces try to dislodge them using cannon. Then they have a cunning plan and start tunnelling below the walls. It’s a very substantial tunnel and - amazingly - it's still there today. The defenders' (slightly claustrophobic) counter-mine, St Andrews Castle. In the tower of the castle (left side of the image near the top of the page) the defenders hear the underground activity. Then they discover they are going in the wrong direction. So they change their minds, start another tunnel, then finally break through. You can still see the 16th-century pick marks! The attackers' mine is pictured here first. It's positively spacious. You can still see all this today though you have to start by squeezing yourself down the counter-mine (pictured here too) in order to emerge into the attackers' tunnel. You can still see the 16th-century pick marks. Amazing. Nothing else like it anywhere in Scotland. And they let you go through it! And it’s all electrically lit now. And how did it all end? Some month later, the castle was hammered into submission by a French fleet, under the instruction of the king’s wife, Mary of Guise, French wife of the (late) King James V of Scotland. The famous reformer John Knox, who had been inspired to preach publicly by the martyrdom of David Wishart, was by this time also a castle resident. He became a galley slave on a French vessel for the next eight years, before returning to his religious rabble-rousing career in Scotland. Final word: the roof of the counter-mine can sometimes be a bit wet. You'll notice when you brush your back against it. I wouldn't wear, say, pale cashmere for your visit!